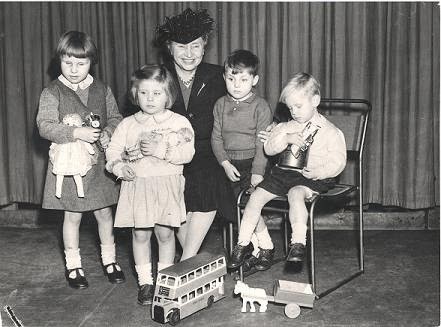 Helen Keller poses with four young schoolchildren. Photo source: American Foundation of the Blind, www.afb.org. 1) Helen has done more than being a Deafblind person who didn't let her physical absence of vision and hearing stop her. You know those inspirational posters with quotes? I recall one that read, "Extraordinary: Ordinary people in extraordinary situations." This is why many people are fascinated with Helen Keller; that's the beginning of it, yes, just do not stop there. She did things for people that you would not expect a deafblind person to go out of their way to do back during her day when they had their own barriers. Her extraordinary situation was just right for her. 2) Helen is not the only Deafblind person we should emulate. There are modern-day Deafblind individuals who inspire others. I hope to introduce them to you soon, as well as to my children. Especially Orion. If you're reading this and are Deafblind, and thinking maybe I'm talking about you... I am. I am not going to encourage Orion to be like Helen ("Be Like Mike") even though he will learn of her story one day. I will, though, encourage him to be Orion Theodore Withrow. I'm starting with Helen Adams Keller. Today, June 27th, is her birthday, born 134 years ago. 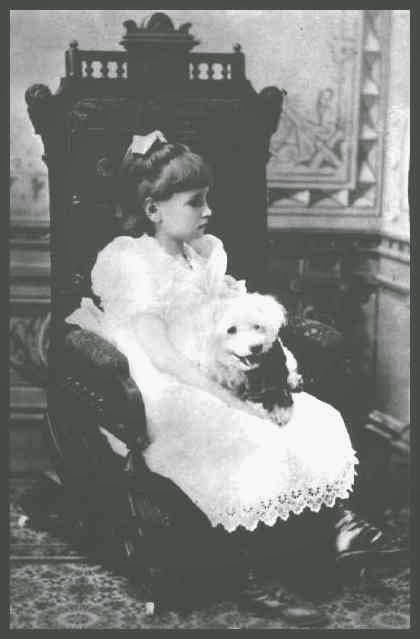 A very young Helen with a dog on her lap. I have not read all the books out there on Helen Keller, nor have I read a book written by herself, but I would recommend two books I've read thus far. The first book was one I borrowed from the local library in good ol' Bothell, Washington, titled "Helen Keller: Rebellious Spirit", by Laurie Lawlor. It was this book I learned more about Helen throughout her life, Anne's possessiveness of her and Anne's successors. Much of, if not all of what I shared here in my post is from my memory reading this book. The latest and I think the coolest book of all I have read was borrowed from the local Austin Public Library branch is Center for Cartoon Studies Presents, "Annie Sullivan and the Trials of Helen Keller", by Joseph Lambert. Disney-Hyperion Books, New York, 2012. This was in a fun illustrated comic book format covering Helen from around the time of Anne's arrival in Alabama to their departure from Perkins School for the Blind. The illustrator portrayed visually, perhaps toward the abstract, how Helen must have perceived her experiences before and during language development. His idea for visual presentation was surprising and fascinating to me. I blogged about it here, Concept Building and the Coolest Book on Helen Keller Out There. Did you know that Helen Keller was born with sight and hearing? She lost both due to an illness during her 2nd year of life (approximately 15-18 months old). However she did not remember the experience of seeing or hearing. I've known of this fact for a long time. When Orion was an infant, I mused that Helen was seeing and hearing during that age. Since typical children learn to walk anytime from before their first birthday to around 18 months old, Helen must have been walking before she became deafblind. There may be other skills she developed during her time with sight. Orion, born completely deaf and very little light perception, is taking the longer road figuring out what those two long, flexible, fleshy soft-on-the-outside, hard-on-the-inside extensions of him are for. The point is, they're both deafblind but come from two completely different etiologies thus different developmental and emotional progresses. Helen's father owned or ran a newspaper publication in their hometown. He included pieces on Helen, this led to her being a news sensation spreading all over our country. You can say this was a Blog of the 1880's. The very first Deafblind "Blog"! 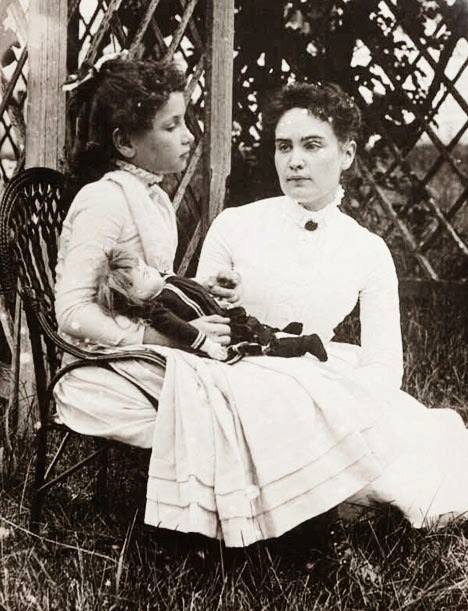 A very young Helen, her doll and Anne Sullivan. Yes, Helen's family was well-to-do, how else would they have hired Anne Sullivan when Helen was 6 years old? Anne was with Helen all the time. Helen has Anne to thank for connecting her to the world and so on. Even though we must not think this is the only way, can you imagine what it'd be like for someone to work constantly through the days and weeks exposing your Deafblind child to planned/unplanned learning and tactile sign language? Helen, however, was not the first Deafblind student in the United States. It was Laura Bridgman. Laura Bridgman attended the Perkins School for the Blind, where eventually Helen's teacher, Anne Sullivan went to school beginning in her youth. You can say the instructional strategies used with Bridgman were in place waiting for Helen when she and Annie came to Perkins after years in Alabama. Helen did meet the elder Laura Bridgman. If I recall correctly from Laurie Lawlor's book, "Helen Keller: Rebellious Spirit", Helen briefly went to a deaf school, perhaps in New York. She was able to use tactile sign language with other deaf students. Several things come to mind based on learning about Helen's brief deaf school experience. Did Helen Keller have any Deaf friends or acquaintances outside of this school? Did she know where to find them? Did Deaf or Deafblind people feel comfortable approaching Helen? These questions make me also muse about her motivation to speak. Is it because she has always been around new hearing people who didn't know signs and speaking for herself she could provide a more direct connection to them? Was the news on her speaking, or using the TADOMA method (Google it) intimidating for Deaf and/or Deafblind individuals? An assumption that she was not interested in meeting them? Now, going on a tangent from this tangent. In Milan, Italy, 1880, the same year Helen was born, the International Congress on Education of the Deaf (ICED) passed a resolution to prohibit sign language from being used in the education of deaf students. As I have learned through the years, Deaf teachers of the Deaf (at least those in America) lost their jobs because they were not able to speak, thus not in compliance with the then latest invention of the wheel. (This wheel kept getting unnecessary attempted makeovers even to this day! The idea is "whatever works". ) This went on for scores of years until around mid-century, Deaf teachers of the Deaf started trickling back into the classrooms. "...Call upon all Nations of the world to remember history and ensure that educational programmes accept and respect all languages and all forms of communication." The financial support from Helen's family dwindled and disappeared sometime after Helen and Anne left Alabama. The duo were fortunately sponsored by other people who cared about them. An example of a fund source was going onto a stage where people pay admission to see and perhaps to hear Helen speak. Whoever was with Helen (Annie or her successor), repeated to the audience what Helen spoke. So many people knew about Helen Keller and she was fortunate to have met famous individuals, including several Presidents of the United States and Alexander Graham Bell (AGB). It is very interesting to note, while AGB opposed deaf intermarriage and strongly promoted choosing only spoken language for the Deaf, he is seen in a photo in Laurie Lawlor' book spelling into Helen's hands. I don't know if he was drawing letters or using the British or American sign language alphabet. 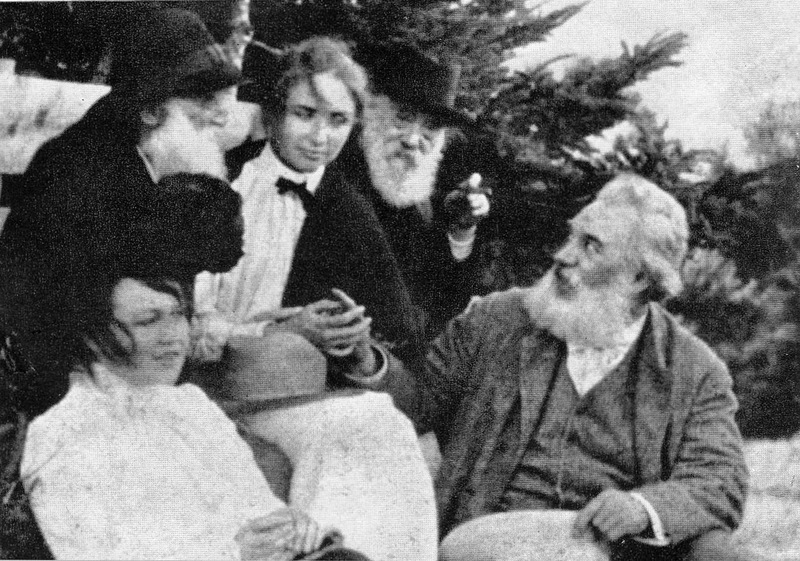 Helen and Alexander Graham Bell communicating tactually as 3 other individuals look on. Helen asked the Lions Club to look out for the blind and deafblind. "Helen Keller addressed the Lions Clubs International Convention in Cedar Point, Ohio, USA, and challenged Lions to become "knights of the blind in the crusade against darkness." Since then, we have worked tirelessly to aid the blind and visually impaired." Helen Keller and Anne Sullivan lay in eternal rest in a gated crypt at the Washington National Cathedral, in Washington D.C. I visited the site while I was a Gallaudet student. Way before hubby and kids. Helen strikes me as an eternal optimist. Eternal optimists get up again and keep pushing on even in unfavorable conditions. In this quote by Helen, she is aware of the opportunities that sprout from just moving on. A realistic yet optimistic quote by her. If I left you somewhat curious- great! Check out a book on Helen Keller, especially the two I recommended. Helen Keller quotes were from Quotationspage.com, Helen Keller (1880-1968), http://www.quotationspage.com/quotes/Helen_Keller. Retrieved online November 27, 2012. This video was recorded on June 1st. I was so excited about Orion signing two things- MORE and SANDWICH and him using my hand to get the burger then bring it up to his mouth. Also he is sitting in a chair without a booster seat or in a high chair. He would bend backward crazily in the booster seat and in the high chair he kept crying and trying to slide out. I decided to put these aside and set him down in a typical chair, he responded well. This is where he is in this video. I would've loved to blog more often but didn't have the extra time to do this. Orion started being very clingy back in March, through April and most of May before he was more comfortable to be left alone to play for a few minutes and then there's the end-of-year school events for all three kids. It's my plan you'll hear from me more often this summer!